US$ 3290 / person ? 1 Arrival to Paro Arrival by plane to Paro or crossing border from India in Phuntsholing/Jaigon and drive to Paro. Sightseeing subject to the arrival time. 2 Paro Early morning drive to Chele la pass (3,800 m) from where you will get splendid views of Jomolhari and Kanchenjunga peaks in good weather conditions. For acclimatization, you should hike up the ridge to nearby hill which is 4000 meters high. If you like, you can continue even further. When you’re satisfied with climbing, get back down and take interesting hike through the mixed alpine forest down to the Kila Gompa, the oldest nunnery in Bhutan. Descend back to Paro and visit Dzongdrakha monastery which is located below high cliffs, overlooking Paro valley. Rest of afternoon spent in leisure, getting ready for next day trekking. 7 Trek Jangothang – Lingshi Distance 13 km, 6-7 hours, 840 m ascent, 870 m descent, camp altitude 4,010 m. This is one of the longest days of the trek. A short distance from the camp the trail begins climbing rapidly for about half an hour and then becomes a gradual ascent to the Nyilila pass at 4,870m. While on the climb enjoy the surroundings. You might see herds of blue sheep grazing on the slopes of the mountains. From the pass you will have spectacular views of Mt. Jomolhari, Jichu Drake and Tsherimgang, all of them rising above 7,000m. It's a gradual descent to the camp where you will pass by some of the yak herder’s tents, made from yak wool. The herders use these tents while travelling tovarious pastures for their yaks. As you come down into the Lingshi basin, a beautiful U-shaped valley, you get a wonderful view of Lingshi Dzong on clear days. Tserimgang and its glaciers rise up at the north end of the valley. The campsite is next to a stone hut you reach just before Lingshi Dzong. 13 Halt: Laya Today you can spend day resting, staying in the village and around or make a trip above the Laya to the glacial lakes in 4650 meters. To reach there you need to cross the ridge which has excellent panoramic views of the mountains. The lake is considered to be home of local deity so you should approach it with caution. After descending you can visit local temple in which unifier of Bhutan Shabdrung Nawang Namgyel stayed in 17th century during his flee from Tibet. Some of the belongings of this saint-ruler are kept there. 14 Trek Laya – Koina Distance 24 km, 7-8 hours, 460 m ascent, 1,070 m descent, camp altitude 3,450 m. This will be quite difficult day. The trail winds up and down along the river valley of Mo Chhu avoiding natural obstacles and affording breath-taking views of the raging river, feeder streams and waterfalls. Lots of ups and downs will lead you to Kohi Lapcha at 3.300 m. The trek then drops down to the large stream of Koina Chhu, where you will find the campsite of Koina. In most cases this place is so muddy, but luckily there is also log cabin to which you can resort. 15 Trek Koina – Gasa Tsachu Distance 5 km, 2-3 hours, 500 m ascent. This will be the last short day of hiking up to Chempsa. You will go through ancient forest through which road is being built. Finally you will reach to place where the jeep can go and from here, you'll drive to Gasa village (2,770m). On the way stop to visit Gasa Dzong, the castle which is actually administration centre of the district. Then continue drive down to Gasa Tsachu (hot springs) and relax in the rejuvenating mineral waters. The Gasa Tsachu is one of the most popular hot springs in Bhutan. Sleep in basic guest house near hot springs. 16 Gasa Tsachu – Punakha / Wangdue Visit the Gasa dzong (castle) in the morning. There are good views from there and few interesting chapels. The dzong is just completing reconstruction of the main tower. Then start drive to Punakha. The trekking is over now. Spend time in leisure, get rest or celebrate the trek's success! 17 Punakha / Wangdue – Thimphu Sightseeing in Wangdue. Climb to Khamsum lahkahang with great views. Then visit to Punakha dzong, one of the most beautiful castles in Bhutan. Chimmy lhakhang, temple dedicated to famous divine madman who was spreading buddhism by rampatn sexual behaviour. Transfer to Thimphu over Dochu-la pass (3.015 m). In good weather we can have nice views here. Druk Wangyel lhakhang dedicated to 4th king of Bhutan also makes nice sight. 18 Thimphu – Paro Early morning drive to Buddha Dordenma, the gigantic statue of Buddha overlooking the valley and walk to striking city viewpoint. See Memorial Chorten, always busy with devotees. Walk in Norzin lam street and see the traffic police signaling in junctions. Thimphu is only capital in the world without the traffic lights. Finish walk at handicraft market where many interesting Bhutanese souvenirs can be seen and bought for reasonable price. Visit hand paper factory a Thangkha painting centre, where young artists learns the skills of their forefathers. After that drive to Changankha lhakhang, the oldest place of worship in the valley. Visit of Tashicho dzong, the castle, which serves as seat of the king and government. Evening drive to Paro. 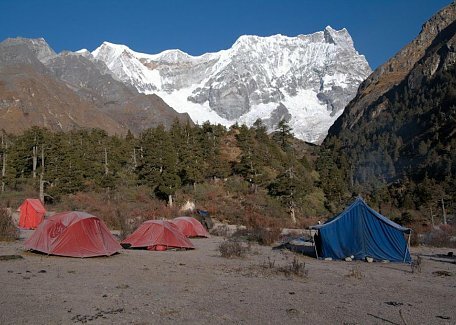 Extend trek to Masagang Base Camp (+2 days): If you're for additional trekking why not to continue from Laya to Masagang BC, another beautiful valley in area with stunning mountain views? See Little Snowman & Masagang BC, 21 days itinerary. Fast & furious trekker? (-4 days): If you're strong and fast trekker, you can consider shorter Crazy Little Snowman, 15 days variant. Skip cultural part (-1 or -2 days): In case you're totally uninterested about the cultural part of the trekking, you can omit one or two days from the program. Anyway please mind that these days are also useful backup in case you get delayed for some reason (snow in the pass or something else). 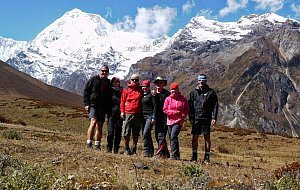 Two weeks we were doing the famous Snowman Trek, the "little" version and one week we spent visiting monuments and experiencing culture and customs. Whole tour was designed just for us and everything was well organized and perfectly secured.